This special metal and wood design includes an oversized rusted steel heart mounted to a petite vintage wood frame with chipped blue paint. 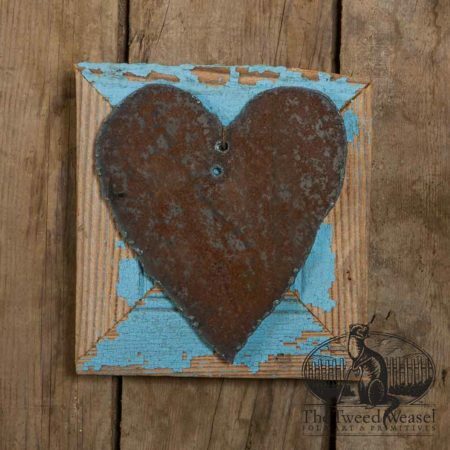 The large heart is plasma cut from 1/8-inch steel. Small sawtooth hanging bracket is applied to the backside for easy hanging. SOLD – We cannot reproduce this design exactly, but if you like the look and style, we can check our materials inventory to build another with similar qualities. Just ask!